Wild horses, vanished thousands of years ago, were settled again, as part of a project for tourism development. The initiative is taken bu the Bulgarian-Netherlands project, “The new Thracian gold” for recovery of the nature in the Eastern Rhodopean region. 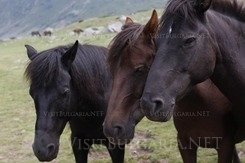 The main idea of the project is to introduce the horses as a tourism attraction. Several nature parks on the Balkans are interested in the project. The animals were brought in special vehicles from the Netherlands and were set free in the region of Krumovgrad municipality. The wild horses are 12 and are part of one family. They will live freely and will probably meet a lot of challenges. The wild horses also known as tarpani, used to inhabit the Balkan peninsula ever since the stone age. The species vanished by the end of the 19th century. Later the species were restored through a special selection of tamed horses in Pollard. The tarpans are quiet, calm and curious towards people. The horses will spend almost 3 years in a secured section of a total area of 3 decares to adopt. 22 year old lady from the Netherlands – Yael van der Schleiss will live in the region to observe their behaviour.